There comes a time in the Northeast when you start to get worn down from the snow and wintery weather that accompanies the endless piles of that dirty white stuff that line our streets. Desperately wanting to ride everyday doesn’t make spring get here any quicker, so much of our time is spent in the garage… like any other motorcycle enthusiast that doesn’t want to don heated gear or deal with sketchy road conditions. Late nights in a colder than normal garage turning wrenches or mashing metal passes much of the time until the comfortable riding season is upon us, but every February I yearn to have some human contact and see what others have been up to in their motorcycle building seclusion. This is where Mike Palazzo of 47 Industries has come to save our sanity for the last 4 winters. The first time Mike spoke with me about the idea of the Unfinished Bike Show, I knew that he was really onto something. I wanted to be involved no matter what it entailed. I didn’t care if eight people showed up to look at four bikes, I was down to get out of the garage for a night and talk to people face to face about their projects, ideas, and chopper dreams. Well, that first year was much more than I expected and the idea of this show has been carried on for 4 winters in a row now. Fast-forward to this past February 22nd, 2014 and the 4th annual 47 Industries Unfinished Bike Show. 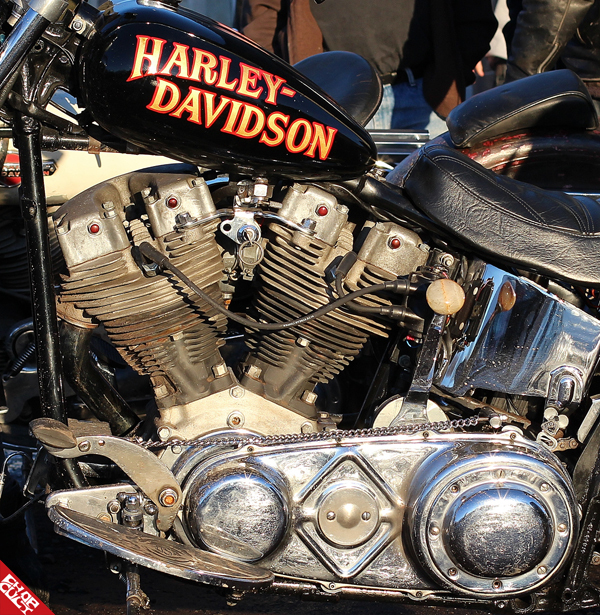 The weather was unseasonably warm(ish) and sunny which allowed the hearty few to ride to the show and bring smiles to all the others jonesing to get their projects running for spring. The mood at the show has always been fantastic to say the least… and this year was no different. 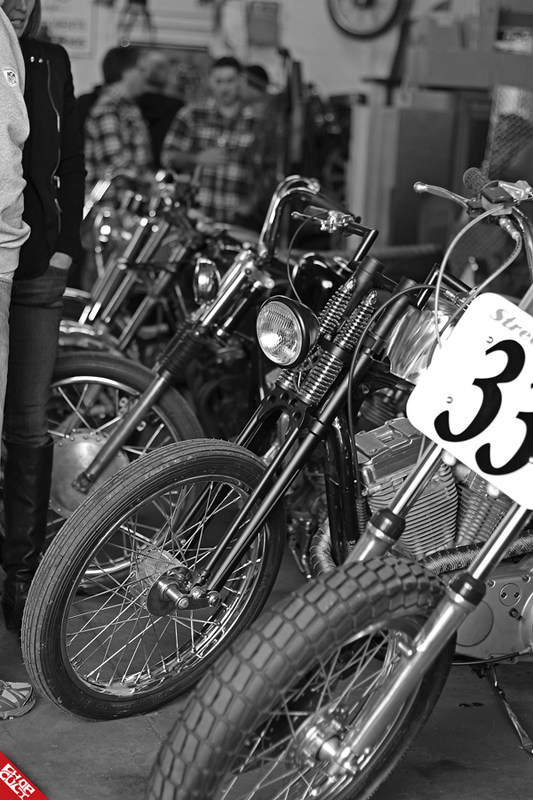 An eclectic mix of street trackers, café racers, long bikes, and choppers of all shapes and sizes lined the interior of 47 Industries. 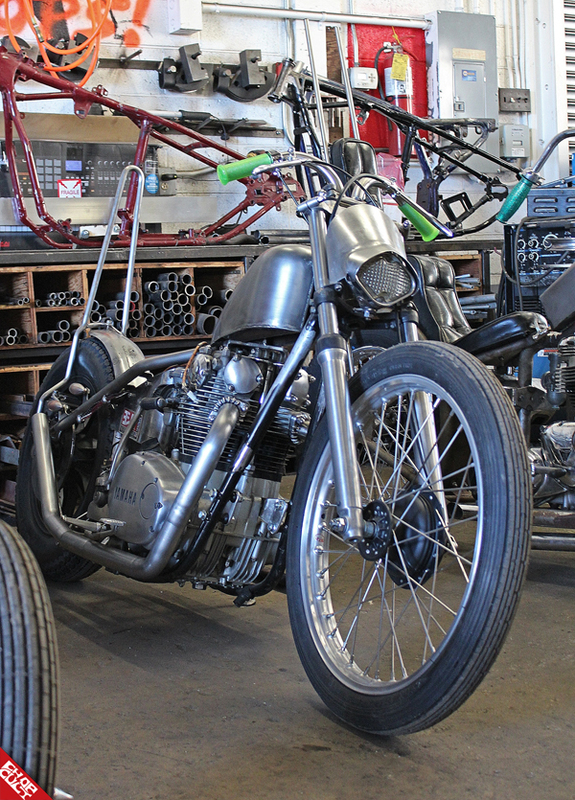 The perimeter of machinery and tools in the shop serve as the perfect backdrop for such a show, ready and waiting to help finish the work on every unfinished bike pushed into its parking spot. Everyone loves to see the behind the scenes metal and fab stuff that’s usually hidden in hibernation at this time of year. Being allowed to see the inner workings of a builder’s mind with no filler or paint in the way is the true essence of this get together. The builders and number of bikes to ogle change from year to year, but the overall feeling of “connection” I get at this show remains the same. Being inspired by the difference of styles, fabrication, and machining methods is what drives this show to the top of my winter to do list every year. Thanks for hosting such a good time every year Mike! You’re a true winter savior here on the East Coast. Thanks for sharing the pics of this event. Very interesting work, wish I could be there. That xs got my attention and also an erection. nice report and pics. snowed here today. again. the sportster Dan Goldman brought in was built by Full Circle V-Twin in Hagerstown MD. Thanks to all that attended and helped to make it a great show and a good time for everyone. Thanks again to ChopCult for including my pictures in this feature, as well as Mike Palazzo for a great event and Jay Roche for a perfect recap of the day. Like I said, I'm humbled to be associated with this and I'm already looking forward to next year's event. Also, thanks to all of the builders who <some unknowingly> allowed me to shoot their projects that day. Thanks for the show, Mike! Twas a blast.